As exhilarating and freeing as working from home and launching your own business seems at first, after a while, you want to get out of those sweats and go somewhere else to work. The distractions of your home office may be taking their toll on your productivity or, you’re starting to feel isolated and cut off from the rest of the business world because your home office is your business environment. You know you need an office space that’s not connected to your home but renting office spaces can lock you into long-term leases that you can’t really afford, not to mention the maintenance and labor overhead that comes with operating out of your own office. Then there’s the whole ordeal of office design and outfitting, with even more expenses for furniture, equipment, technology, coffee, water and whatever other amenities you might want in your office setting. Out of your comfort zone? Overwhelmed at the thought of how setting up an office will pull you in a gazillion different directions and cost a fortune? Opening your own office requires the resources and time commitment that most businesses poised to expand just can’t afford. Coworking spaces allow you to skip that monumental obstacle by offering a variety of different office spaces with flexible monthly leases. This lets you go right on with your growth plans without skipping a beat. While amenities can be looked at as unnecessary by some people, when you or your associates don’t have to take the time and the expense of stocking water and coffee supplies, they can concentrate on working out ways to grow your brand. Additionally, you don’t have to hire a cleaning company or a maintenance crew to keep your office up to your standards. 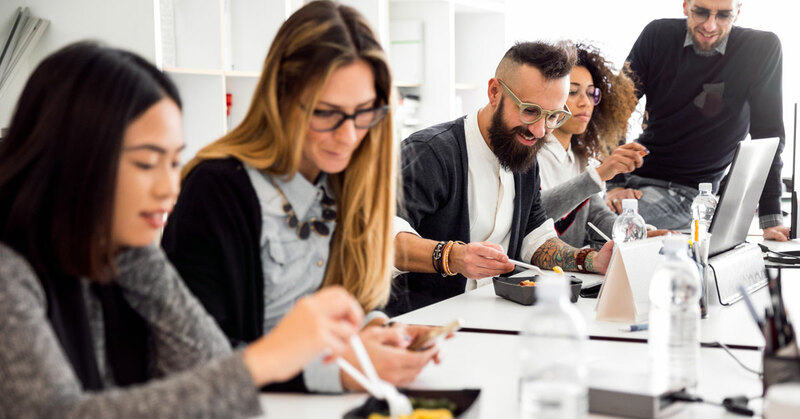 Many coworking spaces feature catering and/or dining options in-house and most coworking spaces are located near other businesses in metro areas. You can take clients to lunch, take the team out for a celebration, or just take a break to refresh and rejuvenate during your workday. Not needing to invest a huge chunk of your profits in technology, printers, scanners, and other office equipment also makes sense for businesses on the brink of expansion. Growing businesses can often need a variety of spaces to work things out. You may need a private office, along with some semi-private desks for a month or so, while you may be in need of a presentation space to launch new ideas, products, and services. Coworking spaces offer conference rooms with full audio and visual capabilities and the printing services you may need for a presentation. Other semi-private virtual office spaces can be the perfect unfettered setup for Skype meetings and training sessions. As the trademark of coworking spaces, networking opportunities are built in by design. Along with the potential to meet other business owners in your community, who can increase your exposure, many of the services you may need as you expand are within arm’s reach. Save time and money by hiring a freelance writer, photographer, or web designer in your network. Other independent companies and services that can be easy to source at your coworking space include marketing and legal help, as well. In addition to meeting other business professionals that can help you stay on your path to further success by providing marketing services or designing your website, you can interact with other business owners who have walked in your shoes and can advise you on how to navigate a certain obstacle. A fresh set of eyes on a project might be just the adjustment you need to fill in a blank to move your business forward. You, in turn, may be able to help someone else with an obstacle they’re struggling with in their business. Working alongside enterprising professionals, as well as getting to know other members of your coworking community, inspires the creative process. Brainstorming with other members could lead to forming new businesses or working with other business owners who need your expertise in developing new projects. Unlike attending social networking events where business cards are exchanged but little else, connecting with your coworking community at social or educational events sponsored by your coworking space, you increase your exposure in the community at large. Referrals from other members help grow your brand footprint when they send business your way via friends, families, and other connections in your community. Coworking spaces also offer their members a business address, along with mailing services that further streamline your business plan. At Venture X, our well-appointed facilities offer you a variety of office space options, in contemporary, high-design spaces. Meeting with clients in our community area or office spaces that impress will help grow your client base and increase your bottom line. With all the services and amenities you need, but without the labor or maintenance involved in opening your own office, you can focus on expanding your business and moving into your next successful phase. Contact us to schedule a tour of your local Venture X location. It seems that coworking spaces have made inroads into all workplace scenarios today. Initiated as a way for startups and entrepreneurs to sort out their business plans and work around other interesting, like-minded professionals, coworking spaces offer something for everyone, so it seems. Small companies with a couple of employees can turn into a company with eighty employees, ready to make the move to open an office of their own. Instagram, Uber, and Spotify, among other mega companies, all started in coworking spaces. Other corporations are finding a niche in coworking spaces, as well. What can a coworking space do for your company in a year’s time? Plenty. Most companies and individuals just bringing their visions to life don’t feel the need to throw all of their efforts and a scary amount of money into sourcing an appropriate office space, building out a space and keeping up with the day-to-day of running and maintaining an independent office. Not only do young companies get a pass on deciding how they want to look when they grow up, but they also don’t have to worry about who will keep up with the coffee, water, and amenities they need for each day at the office. Ultimately, businesses working out of a coworking space save a ton of money, time and energy getting on their feet. Saving money on office overheads works great for new companies but coworking spaces are also popular with large companies, as they can save money not opening branch offices, as well as saving money not flying people into their corporate headquarters. Satellite offices work well in coworking spaces, where corporations can schedule a space for monthly meetings or provide a place for teams to work on a daily basis, with flexible monthly contracts. Eliminating rigid, long-term leases can allow companies to grow organically, not restricted to fashioning their businesses around a space they may outgrow. Purchasing equipment and the most current technology, plus installing and setting up technology becomes a non-issue, saving on those giant purchases until you can actually afford them. Coworking spaces feature laser-fast Internet with all of the technology you need to run a business figured into monthly contracts. Working at a coworking space for a year connects you not only to other business professionals in your area but the entire community as a whole. Building relationships with other coworking members can lead to new client introductions and/or potential team members for your business. Networking events at coworking spaces go with the territory and help businesses grow, as well as providing social networking opportunities for members. Business-oriented workshops can provide insights into something you just can’t quite wrap your brain around about your business and connect you to other members who’ve been down that same road and are willing to share their experiences. Some coworking spaces offer their community areas as event spaces outside of business hours, providing an excellent venue for product launches and other promotional events for your business, with full-service kitchens for catered events. A lot of coworking spaces feature their own full-service cafes and some provide catering every day or on certain days. Readily available, healthy food choices can keep teams on track when needed and can offer a way to relax and take a break from working. Because coworking spaces offer a look into how people work, they are valuable over a year’s time in connecting you to the people you want on your team. When you already know someone’s work ethics and abilities, you can approach them for services you need and don’t want to master, such as web design, photography for your website, marketing, SEO content writing for your blog, and other various components you will find you need as your company begins to grow. The motivating atmosphere in coworking spaces can get creative juices flowing and after getting to know other members, ideas for other companies may hatch into a business when members’ talents converge. Your best idea yet may come to light with the help of another member’s perspective. If it’s your dream to find the perfect space for your company when you’re ready to move out on your own, you can take advantage of your coworking friends’ knowledge about good neighborhoods, buildings to avoid, nearby dining, shopping and entertainment venues and other things, such as parking availability in different areas. Remarkably, coworking spaces grew from one space in 2005 to 14,411 spaces today, according to an allwork.space article. Once a trend bunking traditional office environments, coworking spaces have changed the way we do business. So well-received, large companies are taking advantage of the flexibility coworking spaces offer, with low overheads, well-appointed surroundings, and monthly contracts. Venture X makes a great starting place for your small company to get its feet wet, as you develop your company into a business that needs its own space. Spending a year or so at Venture X, you’ll be rubbing elbows with an impressive list of business owners from many industries, including tech innovators, financial planners, health and fitness publishers, independent attorneys, healthcare professionals, marketing pros, as well as freelance designers, photographers, writers and others, all working together in an atmosphere that inspires productivity and collaboration. Come grow with us at a Venture X location near you. Contact us to request a tour! Seems like a no-brainer, right? You show up because you need to work so you can eat, pay your rent and buy stuff that makes the end result of showing up worthwhile. However, when you’re the boss and possibly the sole employee of your company, so far, you can get sidetracked by other things in your life or periods of time when you can’t seem to work out any aspect of your business plan. Sometimes, you don’t even know where to start to get past a hurdle so you can move forward. It’s at these times that you could use some handy tools to help you show up and account for something, every day. In CEO and strategist Matt Mayberry’s Entrepreneur article, the former Chicago Bears linebacker compares how underdog college football teams show up, upset highly ranked teams and shock the heck out of people who are amazed because they never saw it coming. Mayberry says that in football, as in “building businesses, organizations and whole cultures” you need to show up every day. He went on to say that the reason we see these upsets in sports, as well as in business is due to the fact that sometimes people forget to show up. First- and second-ranked teams can lose their edges and not show up on particular days when hungry, lower ranked teams show up ready to win. From his football training, Mayberry borrowed the idea of focusing on one key area each day. “After a couple of months, I noticed what a great impact this was making on me in becoming a better player overall.” Adopting this practice in his personal life, Mayberry maintains that he still uses this approach today. Focusing on one key area can improve your overall productivity level and work wonders in a myriad of ways. Practice things that you aren’t comfortable within your business. “For example,” Mayberry says, “if you’re in sales, maybe you are working on getting better with cold calls one day, and then the next day you are working on improving your communication or prospecting skills.” You might want to work on presentation skills if your business requires numerous live presentations or videos. Compartmentalizing tasks into focused pieces that you can work on one day and move to another task or area the next day works because, “It’s not overwhelming yourself with 1,000 different areas you need to work on, combined with your already hectic schedule,” Mayberry says. Working in an environment, alongside entrepreneurs and like-minded professionals motivates business leaders towards results. Whether you need a cheering squad or a trusted colleague to consult on your project, coworking spaces foster these activities. Not only for the social aspects of coworking spaces but the intrinsic networking effect in coworking spaces encourages members to seek help from other members. When you need help for those hurdles you can’t wrap your brain around, to hone in on a technical issue or resolve other issues that might subconsciously keep you from giving your business all you got some days. Much like a college course, say a creative writing workshop, where everyone has to read everyone else’s short stories and critique them, coworking members are willing to help someone else through an issue that may have held them back in the past. Who knows? Working alongside someone can lead to new ideas, which lead to new ventures with new partners you already know. At Venture X Naples, we think there’s something special about coworking spaces. Working in an upscale, well-appointed facility in the heart of Naples, the Mercato neighborhood buzzes with popular shopping, dining and entertainment options, just minutes away. Our diverse community of coworking members thrives in a variety of different types of spaces, from our community spaces to semi-private or private offices with your own business address. Technically proficient conference rooms are available for meetings and presentations, as well as our community area that can be rented for your launch or as a networking tool. Like Matt Mayberry tells us, “Showing up every single day of your life is critical when it comes to the success of your business, organization and individual success.” To keep from sliding into a comfortable zone of thinking, “you’ve made it and don’t have to work as hard, someone, somewhere is already gaining an advantage over you and working to surpass you.” Mayberry’s take away goes like this: “Champions show up every day, whether that occurs on the field, on the court or in the boardroom. Showing up may help you be one of them.” Showing up at Venture X Naples can keep every single day moving forward with your business goals solidly intact, in one of the most exciting ways. And then there’s the beach nearby when you need to focus on your sunny disposition. Contact us to schedule an interview at (239) 300-9601 or request a tour online. Starting your own business can be a great way to make your entrepreneurial idea a reality. Lots of startups do not require working from an office so many budding entrepreneurs work from home. While this setup offers many perks, such as savings on business attire, coffee and lunch expenses, it can present awkward scenarios when the time comes to grow your team or meet with potential clients – with your roommate or family living their lives around your meetings. Plus, you can’t even get a Google business listing with your home address. When it is time to take your startup to the next level, you will need a dedicated workspace. Your options: a traditional office space or a coworking space. For most startups, coworking spaces make sense for some really good reasons. While working from a coffee shop can be a lot cheaper with free Wi-Fi and the baristas who know your regular order, coworking spaces offer many options and plans to fit any budget. There’s also free coffee, super-fast Wi-Fi and many more amenities that come built-in to your membership. Most importantly, you’ll have a fancy mailing address for your new business without spending the time and money you would need to rent an office space in a reputable neighborhood and outfit it with furniture, décor and all of the office equipment you need to run your business. Think about how much you’ll save on coffee and bottled water. No worries about cleaning and maintaining a rented office either as those services are included in coworking spaces. Additionally, Venture X Naples does not tie you into long-term leases; we rent monthly. This flexibility gives you the freedom to come and go as your business needs take shape. As your startup evolves and your needs change, you might want a space for five employees to work on a project one month and a space large enough for 12 members of your team the next month. Our office spaces can easily scale up or down to meet your space needs from month to month. For tech startups that don’t necessarily need to work in the same location every day, we offer many different size spaces with varying degrees of privacy for intermittent meetings. Our community plan includes access to our community areas one day per month with additional day passes available for $25 per day. When it is time to present to your team or to pitch your business to investors, Venture X Naples’ conference rooms are fully equipped with state-of-the-art audio/visual technology. Available at $40 per hour, our conference rooms are equipped with everything you need for successful business meetings. Coworking spaces cater to the needs of startups by offering a wide range of services to get you up and running. As your brainchild idea starts to take shape, there will be many day-to-day aspects of your business that you might not have considered. Your Venture X Naples membership gives you live and online access to our member directory. In our diverse community, you’re sure to find members who can help you with marketing, accounting, benefits, as well as setting up an online presence. In the bigger picture, Venture X Naples presents monthly events geared towards educational, social, cultural and entrepreneurial themes. The very nature of coworking spaces lends itself to networking and collaboration. While many coworking spaces are dominated by young professionals and tech startups, Venture X Naples enjoys a truly diverse cross-section of the Naples community. From attorneys in private practice to fitness and healthcare professionals, investment startups, architects, freelance writers, photographers and web developers, our community is well-represented by many professions and industries. At Venture X Naples, a collaborative spirit helps like-minded professionals stay motivated and inspired to make great things happen. Synchronicity has a way of feeding the creative process to produce optimal results. New connections may lead to new business opportunities. For startups, the energetic, networking environment of coworking spaces can spark new ideas and help build your brand presence in the community. Starting a business, especially your first one is not going to be the best day ever, every day. You will encounter hurdles you never even considered you’d have to deal with, times when you just want to scrap it all and obstacles that you just can’t figure out how to get around. But when you are surrounded by other business professionals grappling with the same or similar issues, you can share resources, point each other towards solutions and learn from other business owners that have tackled the same challenges when starting up their businesses. Venture X Naples encourages members to share their experiences to help each other succeed. Coworking spaces, such as Venture X Naples are changing up ideas about office environments. For startups, coworking spaces bridge the space between working at home and moving into your own office, as your startup begins to grow into an established brand. Contact Venture X Naples to learn how your startup can benefit from working in an environment that is geared towards your business’s success. In addition to the awesome immediate surroundings, the hospitality and the inspired network of business professionals, we are conveniently located in the heart of Naples. The Mercato neighborhood features many exciting dining, shopping and entertainment venues, just a short walk from the Venture X Naples facility. And if that’s just too much to process all at once, we’re just a five-minute bike ride from Naples’ white sandy beaches! Contact us today to set up a tour of coworking space!